The facts of the Ferguson, Missouri case are still unclear, which, of course, hasn’t stopped anyone from jumping to definitive conclusions on the matter. All we know is that two men allegedly attacked a police officer, and at least one of them ended up dead. The police chief says they assaulted the officer while he was getting out of his car, and that a struggle over the officer’s firearm ensued. Some eye witnesses claim that Mike Brown, the man killed in the altercation, had his hands up and was surrendering when the officer callously gunned him down. These eye witnesses could be painting an accurate portrait of the incident, or they could be mistaken, or they could be lying. Or, as is almost always the case, there is a bit of all of these factors at work. I don’t know. I’d prefer to let the dust settle and all of the facts come to light before I make any proclamations about the exact nature of the event. This is a radical and unprecedented approach, I realize, but I’ve always been a trailblazer. I like to call my strategy “don’t be a reckless, ignorant, hysterical instigator who immediately diagnoses a situation based on whatever overarching political narrative you subscribe to, and then reaffirms those assumptions by quickly ingesting an assortment of Tweets and half-cocked headlines from notoriously ideological news outlets,” or the DBRIHIWIDSBWOPNYSTRTAQIATHCHFNINO method, for short. 1) Hating all cops because some of them are abusive isn’t any more justifiable than hating all black people because some of them protested an officer involved shooting by burning down their own neighborhood. I’m as critical as anyone when police officers take advantage of their power. I think some cops are arrogant jerks and I think law enforcement, in general, is becoming overly militarized. I’m also a huge proponent of civil liberties and a passionate defender of the 4th amendment. That said, a just and civilized society needs laws, and laws need to be enforced, and police officers are entrusted with that noble and necessary task. If a thorough investigation reveals this particular officer to be guilty of murder, by all means arrest and prosecute him. But whether he is or isn’t, only a ridiculous fool would use this incident, or an incident like it, to disparage all police officers everywhere. His numbers might be accurate, but what sort of lunatic or liar would interpret them this way? Every time a black man is killed by a cop he is the victim of terrorism? So cops either shouldn’t try to stop black men from committing crimes, or they should, but if they meet lethal resistance they should run away or surrender and die? Such an enormous dose of idiocy in that statement, but it’s a notion echoed by many people across the country. The news about Mike Brown’s death prompted a tidal wave of “f**k the police” sentiments from black and white liberals alike. Meanwhile, let any one of these cop hating cowards find themselves in a precarious spot, and watch how quickly they dial 911. Criticize bad cops all you want, but police do important work under immense stress and pressure. Why is it that we are supposed to “understand” and empathize with looters and rioters, but we can’t give even the slightest bit of slack to men and women who put themselves in harm’s way to keep peace and order in our society? Why are we quick to listen to the plight of the carjacker and the drug dealer, so willing to put their behavior in “context,” yet we fail miserably to comprehend the fact that cops — particularly cops in high crime areas — are dealing with domestic abusers, addicts, thieves, murderers, pimps, and the various other dregs of humanity on a daily basis? This might take a toll on your psyche after awhile; perhaps make you jaded, cynical, even bitter. I know it would to me, and I know the police who manage to be decent in spite of it all deserve an immense amount of respect. It’s childish and absurd to hate all police. Yes, cops might have a contentious rapport with people in the inner city, but that’s because they are law enforcers, and inner cities have more than their fair share of law breakers. Why do we pin this strained relationship squarely on the police and never spread the blame to people who choose to commit crimes? We can hold cops responsible for their mistakes without descending into this sort of juvenile, anarchist madness. A healthy and rational society respects both the law and those entrusted with upholding it. I wonder: do the people who seem to oppose the very existence of police officers have a plan B option? We get rid of cops… and then what? Have you guys thought this through at all? 2) Only one thing causes looting: the greed and selfishness of the people doing the looting. 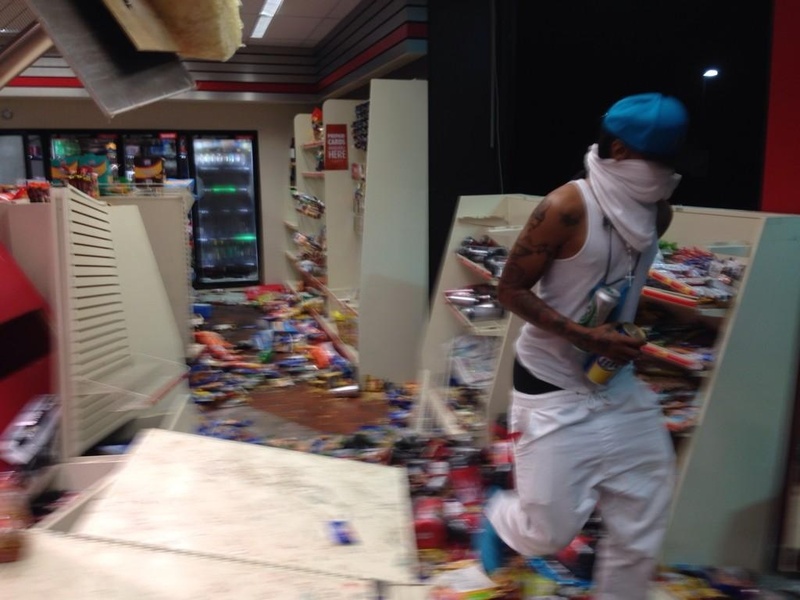 I’ve seen a lot of people today insist that we ought not concentrate on the folks stealing, vandalizing, and setting fires over in Ferguson. We should instead discuss what “caused” it. Ok, let’s do that. They are human beings with free will who chose to commit evil because it suits their own ends. That’s what caused it. Period. No need for further analysis. Stealing from innocent citizens and setting fires to cars and gas stations — these are not political statements. These are acts of savagery. Some people have actually tried to compare the Ferguson riots to the Boston Tea Party. Hmmm. Let’s see. On one hand, we have the Sons of Liberty dumping tea into the Boston Harbor as a specific protest against the Tea Act, while on the other you have a violent mob grabbing handfuls of cheap wine and cigarettes from the local QuickTrip as a protest against something that was not at all related to anything they’re doing. Sorry, I’m just not seeing the resemblance. 3) The best solutions to any community’s problems can be found within. I know it’s frustrating when annoying right wingers like myself always rain on the cop-hating, death-to-whitey parade to point out how black kids are, by and large, under attack from other black kids, and the black community is in a tragic state of self-destruction. But we wouldn’t need to do that if the Mike Brown and Trayvon Martin kinds of incidents weren’t immediately seized upon to prove a universal narrative of black victimhood. You want to simply discuss Mike Brown? Fine. Wait until the facts are in and the smoke has cleared (literally) and we can talk about Mike Brown. But liberals aren’t interested in making this a narrow and specific conversation. 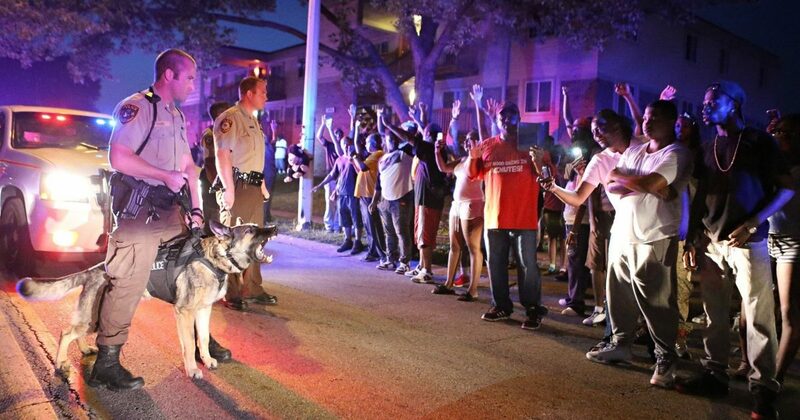 They want to make Mike Brown into another casualty of White America’s war on black teens. It’s in response to that kind of nonsense that one must introduce a few other items for consideration. If this is to become a debate about the plight of black Americans (and I’m not the one who turned it into that) then the debate will be utterly useless if it doesn’t begin and end with the sad reality that 70 percent of black kids are born to unwed mothers. Over 60 percent of black children grow up in homes without fathers. Black people are killed by other black people much more frequently than by cops. Black babies are murdered in the womb at such a pace that now, in cities like New York, a black child has a better chance at being aborted than born. Everyone knows these statistics. They come as no surprise to anyone. Yet, still, we always hear about how the black community is being held down and oppressed, as if black men don’t willfully choose to abandon their children, and black parents haven’t decided themselves to exterminate an entire generation of their own. The real problems are ignored, the people who mention them shunned, and instead we wait for an officer to kill a black teenager so we can pretend that such incidents are the primary reason why the black community struggles in this nation. But their silence is rooted in indifference, not kindness. They don’t care about black Americans, they care about proving a point. The pattern will continue and nothing will get better, until we learn to be honest about things. Hopefully that day comes soon, but I’m not holding my breath. NOTE: This post originally called Ferguson one of the most crime ridden areas in the country. According to a number of readers, my sources were wrong, or I interpreted them inaccurately. In any case, what I read pegged Ferguson in the top 6 percent for crime rate per capita. Apparently, this was incorrect, or at least misleading. Duly noted.